Obsolete: Crying over spilt liquid. There will be more than a few surprised people tonight, both in the media and outside it, at the verdict reached by the jury in the "liquid explosives" trial. The case, after all, had been presented, as George Tenet famously said, as a "slam-dunk". Here were 8 Muslim extremists, caught red-handed with quantities of hydrogen peroxide, used by both the 7/7 and 21/7 bombers in their attacks, having recorded "martyrdom videos" and with apparent plans for the blowing up mid-flight of an unspecified number of transatlantic planes. 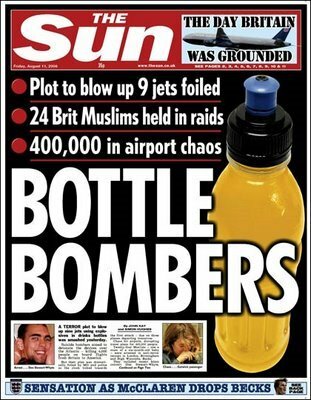 There were shrieks of initial incredulity then horror from the press, all liquids in containers above 100ml were banned from planes as a precaution, with mothers having to taste their babies' milk, apparently as a result of claims that the bombers were prepared to blow up their children and use their bottles as containers for the explosives, and from both the police and the politicians, accusations and boasts that they had successfully foiled mass-murder on a grand scale. Two years later and at the end of the £10,000,000 trial, just three of the suspects have been convicted of conspiracy to murder, and even then not on aircraft. One man has been acquitted altogether, while five others will most likely face a retrial after the jury failed to reach a verdict on their charges of conspiracy to murder. Already we have those with close contacts with the spooks being highly defensive: Frank Gardner on the BBC more or less suggesting that the security services were outraged that the jury had failed to reach the right verdict. The Sun tomorrow has a very similar, defensive editorial from what I've seen. All of which brings to mind the fiasco of the "ricin" trial, where as everyone now knows, there was no ricin, and where only Kamel Bourgass, who murdered a police officer whom was attempting to arrest him, was convicted of any conceivable plot. The analogy is not quite right, because while the ricin plot was laughable and absurd, this one was clearly not, and what else is clear is that at least the three today convicted of conspiracy to murder were deadly serious. What is similar is that both appeared to have ideas way beyond their station, that they imagined they could pull off an incredibly dastardly and fiendish, murderous plot, despite their own inadequacies and lack of training. If you examine the actual prosecution against the men somewhat closer, it soon becomes apparent that the case for planes to be blow up in mid-air was if not completely weak, hardly robust. For all the surveillance work that was undertaken on the men, which seems to have amounted to hundreds of hours, they don't seem to have at any point caught them directly discussing the plot, let alone the idea that they were going to blow up planes, or if they did, we don't seem to have been given the access to it which the jury was. The only evidence that convincingly points towards airplanes being the target was the flight times which were found on a memory stick in one of the men's possession, and the diary notes made by the alleged ringleader, Abdulla Ahmed Ali, that give the impression that the materials which were to make the bomb were to be smuggled through security at airports. It's little wonder that the jury failed to reach a verdict, as such evidence was hardly likely to convince a jury beyond reasonable doubt of their guilt, as the prosecution and security services surely knew. There have been reasons from the very beginning to doubt that even if the plot was to mirror that of Project Bojinka, dreamed up by Ramzi Yousef and Khalid Sheikh Mohammed, that these individuals would have been any more successful than Yousef in their attempts. The story at first was that the ingredients for the bombs were to be taken on the planes and mixed in the toilets, which was quickly laughed at by scientists for its impracticability. Instead what the prosecution set out to prove was that the bombs were instead to be manufactured at the flat beforehand, then smuggled onto the planes in soft drinks bottles, before being detonated mid-flight using hollowed-out batteries filled with the explosive HMTD, with cameras or mp3 players used as the power source. To this end the prosecution showed the jury film of government experts detonating bombs to this specification, and as could be expected, they packed a mighty wallop. Those videos were replayed again today, accompanied by an American video of an aircraft being torn apart by an explosion, supposedly again via similar explosives, although no real explanation about this test was given. What was not as well reported by the media was the fact that the explosives expert giving evidence admitted that it had taken them over 30 attempts to construct a viable bomb, and that the one they showed had been one of a series, doubtless the most powerful. They also had to admit that the components were so volatile that the detonator had to be added by mechanical arm, rather than by a human, lest the mixture go off in their faces. So, as yesterday, this is the experts who know what they're doing using the exact same materials as the rank amateurs were meant to, and the danger of rather than explosives blowing up a plane but instead going off in the face of the bomb-maker was so great that the detonator had to be inserted using a remote-controlled machine. We're meant to assume that if this plot was going to come to fruition that the 8 men were going to overcome the volatility of the materials they were using, something the experts couldn't, succeed in smuggling the bombs onto an airplane without the explosives going off prematurely on the journey to the airport and then the plane, and then again manage, after fully constructing the bomb, to detonate it without anyone else noticing what they were up to with an explosion so successful that it would result in the deaths of everyone on board. Additionally, the prosecution also admitted that no viable bomb had been constructed by the men, although this was supposedly only a matter of time. Quickly, now that the trial has reached a somewhat ignominious end, the security services are searching for an acceptable reason other than the over-egging and exaggeration of the plot. Being fingered are the Americans, for upsetting the applecart in the first place. It was they who apparently ordered the Pakistanis to arrest Rashid Rauf, who is alleged to have links to al-Qaida, and who is wanted here in connection with the murder of an uncle. This arrest apparently either would have alerted the bombers to the unravelling of the plot, and so have gone forward with it, despite the apparent lack of readiness, with some of the proposed bombers not having passports, and with no viable bomb actually constructed, or would have led to them destroying the evidence. Indeed, some have suggested that there was a message received from Pakistan for the bombers to "go now", again despite their inability to be able to do so. The difficulty in confirming this version of events is obvious: Rashid Rauf mysteriously "escaped" from custody in December last year, although the charges against him had already been thrown out. For all these reasons it was prudent to be sceptical about the ability of the men to carry out such a complicated and spectacular attack. Again, there have been repeated accusations of links to al-Qaida, with Ali apparently in Pakistan at the same time as Mohammed Siddique Khan and the ringleader of the 21/7 attacks, but this is hardly conclusive evidence of al-Qaida membership. Despite the success of 9/11, al-Qaida has generally stuck to the tried-and-tested lone bomber or car/truck suicide attack. The difficulties with replicating such tactics here are that the explosives which make those attacks so relatively simple and cheap to pull off are not readily available. The fertiliser bomb plot has been the only recently foiled terror attack which was to involve the more conventional ammonium nitrate. The 7/7 and 21/7 attacks instead involved the boiling of hydrogen peroxide and mixing with other household items to create either TATP or HMTD, both of which are extremely volatile, especially when boiled to the dilution required for the bombs to pack a large enough punch at 500ml. The plotters did have decent quantities of hydrogen peroxide, probably well beyond what they needed for 8 500ml containers. We also now know that they had apparently sought out other targets, including nuclear sites. al-Qaida generally prides itself on its technical abilities; if this was their doing, would they really have been so set on a Project Bojinka style plot where it was by no means certain that it could be pulled off, especially with hydrogen peroxide rather than nitroglycerin? Why not instead go in for a repeat of the 7/7 attacks, or step it up slightly and go for a car bomb targeting another soft target, like the Glasgow airport attackers, but with actual explosives? All of this ought to have sown doubts in the minds of the jurors over the bombers' intentions. Just to stress again, it's clear that some of these men were potentially highly dangerous, especially those convicted of conspiracy to murder. They were certainly takfirist jihadists, or at least some of them were. Again, this is undermined somewhat by the doubt over just how far the plot had gone along: only one will was found, and the prosecution only seem to have said that Ali was certain to die in the attacks. If they hadn't been arrested or been under surveillance, they may well have gone on to take part in an attack which could have killed innocent people. Once again though, it's difficult not to be shocked by the incompetence, arrogance, egotism and extreme exaggeration which took place both before and after the disruption of the "plot". It's worth remembering that just the day before John Reid had delivered a speech ridiculing civil libertarians as not getting it, when he most certainly knew that very night that raids were going to be taking place to bring the accused in. He and police officers then delivered bloodcurdling claims that this was to be "mass murder on an unimaginable scale", already potentially affecting the possibility of the men getting a fair trial. As Craig Murray notes, the most diabolical hyperbole was spread about the men potentially killing their children and using babies' bottles, when this was nonsense as the trial showed. All along, they knew just how weak the case was but are now most likely again likely to blame the jury instead of themselves. Then there's the media, which swallowed wholesale from the very beginning the whole idea that such an attack involving liquid explosives was possible, even while experts were disputing it. The coverage of the trial was an absolute joke, as evidenced by my attempts to get to the bottom of the claims about the explosives themselves: different papers and sources seemed to be inclined to provide only one different fact between the lot of them, with the BBC mentioning that up to 30 attempts had been made by the experts before they succeeded, something not reported elsewhere, and the Telegraph reporting on the volatility of the bombs, while only the Press Association and the Guardian mentioned that the men had not succeeded in building a viable device. Half the reason why there will be so much surprise at the verdict is that they failed to bother to report almost any of the defence case apart from the stunt and documentary one. Even much of the prosecution case was ignored. Some will doubtless argue that if the men had been left longer more damning evidence would have emerged against the men. Most likely it would. That still however leaves the open quandary of the expertise needed for viable bombs to be made, which further gives the impression that they may well have abandoned the Bojinka style plot further down the line, if indeed they had at any point planned to blow up aircraft. None of this however justifies the politicising of the raid by New Labour at the time, the idiotic and reprehensible briefings which accompanied it about the casualties that would have been involved, and the general assuming of guilt which is now common place in terrorist cases. It has to be remembered that cases like this are the ones being used to further dilute our own liberty, the apparently limitless amounts of information which the group had pointed to for why 42 days or longer is needed, all without there being anything approaching a real, immediately dangerous plot being disrupted. We have comprehensively failed to keep the terrorist threat in perspective: it's true that we have to be lucky all the time and the terrorists only have to been lucky once, but this needs to be seen in the context of the failures which are now totting up. First 21/7, which was extremely lucky, then this plot, which was ridiculously overblown, then Abu Beavis and Abu Butthead, with no explosives but plenty of petrol and canisters. Add in Nicky Reilly and what we see are fantasists, unable to live up to their ambitions. If these are the pick of the al-Qaida crop from this country, do we really have so much to fear? It's time that we looked more realistically at the threat and demanded that the age of spin and politicising of it came to an end. Only then might we then learn more about how to more effectively fight it before the raids become necessary. "We have comprehensively failed to keep the terrorist threat in perspective..! That certainly applies to the general public but it is hardly their fault. So far as the politicians and the 'Security State' are concerned, gross exaggeration of the threat is a very useful policy tool. Its use is calculated and I see no sign of it being abandoned any time soon. Jaqui Smith's broadcast response to the verdicts included the words: "I'm sure many will join me in thanking the Security Services whose work in disrupting this plot has saved countless lives". No qualification at all - 'HAS saved countless lives' - that didn't just slip out it was scripted. Thanks for this. Call me a conspiracy theorist if you like, and I have no proof whatsoever, but could this all have been an elaborate exercise to get a British agent - Rashid Rauf - into the Al-Qaeda circle? ITN news was reading from the same script, "The jury didn't understand". I expect we'll be reading of reading of big payouts to people wrongly jailed as terrorists sometime in the future. Birmingham 6, Guildford 4, etc. And yet, there's going to be a retrial. Presumably new and compelling evidence has been revealed overnight...*cough*. Well not sure I think if your innocent fine, but if they are guilty I wonder what would have been said as the bodies are pulled from a building or a plane or what ever, we do have a problem with some people they do think different then some people that death of the innocent is just a means to an end. Look at the doctor in Scotland at the airport it was amateur it was stupid, it could have been deadly. Lance Price and the safety elephant. Must have been those Kegel exercises.